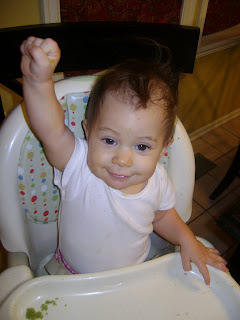 do not ask me what this is, but she did this fist in the air thing right when I snapped the picture and we were cracking up! It's like she was saying, "Yes to mess!" she will even do it for Avery! Craig taught Bailey to raise her arms to be tickled a few days ago. It's really cute and I love that I have evidence now that she understands what we are saying to her! 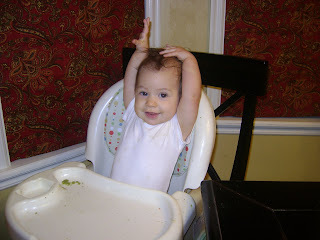 She will even do it if we are not raising our arms so I know she's not just copying us. She signs "more" and "all done" for me when I ask her, too! 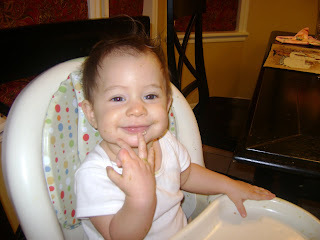 Also in this post (because it was all on the same night) are some really messy pictures of Bailey. 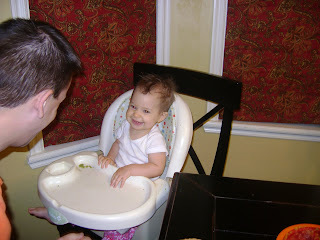 It's hard to make it out in the pictures, but she had peas all in her hair and all over her and the highchair! This was the messiest I think she has ever been! She was rubbing it all in her hair and we just let her. It was so funny! Precious sisters in that video!